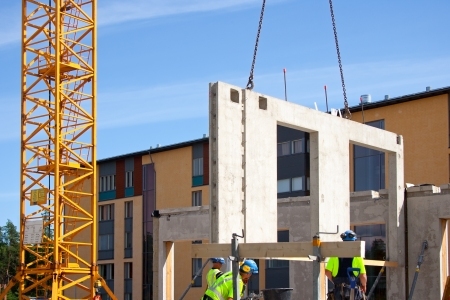 New research from Lloyds Commercial Banking suggests that house builders are modernising their construction methods and investing in skills training to boost productivity and supply. Some of the innovative construction techniques being employed include panelised systems (56%) and modular housing (68%). However, the report also highlighted an on-going shortage of skilled workers with almost a third of firms reporting national and regional recruitment difficulties. More than half stated that Brexit was making recruitment harder for specific roles. A quarter said that access to EU labour was a key challenge for their business. However, the report also suggested that most firms are tackling the shortage by investing in staff training (69%) and half (51%) are putting in place apprenticeship programs. Despite current uncertainties, optimism remained steady at 6.9 out of 10, with 10 representing the highest level of optimism. The research also concluded that growth ambitions remained strong at 29% of current turnover over the next five years, slightly up from 28% last year. To fuel this growth housebuilders expected to reinvest 31% of their current annual turnover, a slight reduction from the previous year’s estimate of 35%. The research was undertaken by Coleman Parkes in Q4 of 2017 and one hundred housebuilding firms completed the survey. It was announced in February 2018 that a modular tower block is to be built in London. The component modules will be constructed off-site and dropped by crane into place. This Croydon based affordable housing development will be one of the tallest examples of this type of project. Given the volume of New Build homes required this type of construction practice will become increasingly necessary in the UK.